What Were Nikon’s Reported Numbers? Left axis is billions of yen and represents sales volume of the Imaging business (not unit volume). 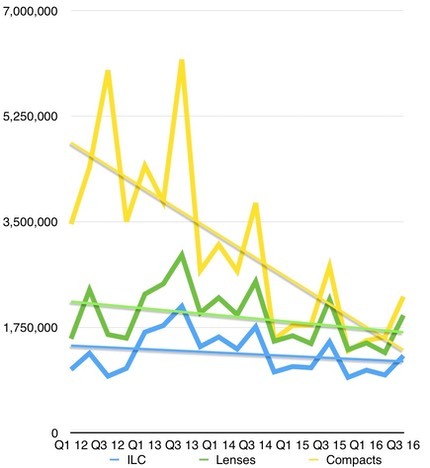 Bottom axis is the Nikon fiscal year quarter (they just reported the last calendar quarter of 2015, which is their third quarter for fiscal year 2016 [yes, I know that’s confusing]). 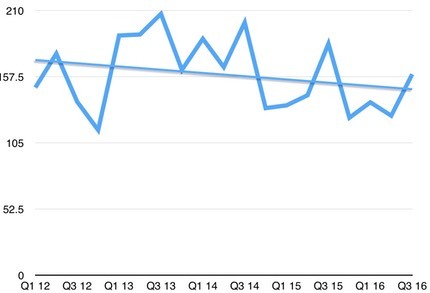 The straight line is the linear trend line from these quarterly results. Simple problem: the trend in terms of number of dollars taken in is downward. That’s why Nikon has been so pushy on cost cutting, as that’s the only way to keep profitability up. Remember, Nikon’s Imaging business produces a bit over two-thirds of all the company sales, but it produces profit that cover losses in other business, particularly the nascent medical business, which is bleeding yen at the moment. Here we are talking about unit volume (left axis). Note that the linear trend line for all three types of products Nikon calls out in their financial statements is on a downward slope (the straight lines). Coolpix has basically crashed. The interchangeable lens cameras and lenses for them are in clear decline. The thing that strikes me is the declining peaks for the Christmas holiday quarter from 2012 through 2015 (calendar year). That’s never a good sign. And I should point out, that this graph includes models that Nikon dumped into the gray market, which puts price pressure on the units that they try to sell through subsidiaries. The method Nikon has been using—as have almost all the camera makers—is an attempt to get customers to move upward as they upgrade. In particular during the period graphed above there was essentially no pro DX body in the US$1500-2000 price range. Instead, we had FX bodies that tried to live in the US$2000-3200 price range. Those prices eroded fairly rapidly. A bit more rapidly than we typically see the lower priced models erode during their life cycle (up until the peak of ILC sales, that was typically 25% discount from initial listed price). We’re watching a potential train wreck here. That’s because we have a missing customer: new-to-camera purchasers. During the upswing, everyone increasingly moved from film cameras to digital, and new-to-camera purchasers were still present in the market. During the downturn, we now don’t have enough people moving from smartphones to dedicated cameras. Indeed, we have a whole generation of users who are far less likely to buy a dedicated camera than their parents were. Why? Because those dedicated cameras just don’t connect to their social media. Meanwhile, the push towards higher priced cameras in lower volume works to a fair degree, but only on the already committed dedicated camera user. Still, that group is aging rapidly. Almost daily now I’m getting emails from DSLR buyers who are trying to figure out what their Last Camera will be (note when I wrote that article, and that was an update to an earlier article ;~). So, the push upward, at best, can only be a temporary one. What doesn’t exist is the US$500-700 camera that goes well beyond what a smartphone camera can do in terms of lens and quality, but is perfectly integrated into today’s (and tomorrow’s) social media. Nikon is rumored to be introducing a whole new set of compact cameras at CP+ next week. That’s exactly where Nikon needs a better answer if they want to stay a camera company. So what should you look for in those introductions? Well, most of you reading this are looking for a competitor to the Fujifilm X100, Panasonic LX-100, or Sony RX lines. That’s because most of you are in the “still upgrading upwards” category and value a small dedicated digital camera that’s better than the one you have. You’re also male and over 40 years of age. Indeed, you probably average right smack dab in the middle of the Baby Boomers, which means you’re moving into retirement soon, if not already. Not a market Nikon or other camera companies want to neglect, but not the market that will turn the tide for them. No, what we should be looking for is whether Nikon got a clue about what camera would truly sell to someone 15-35 years of age, and regardless of gender. Even a clue would be a right step, though those trend lines you see above are going to continue downward unless Nikon gets more than just a clue. By no means is Nikon in any current danger of failing. One thing I learned in the high tech business is that companies and product categories generally don’t just drop off the cliff. They decline until the mass market no longer sees them. One question that comes up when I do these yearly analyses of the state of the camera market is this: does it matter? Yes, it does. Being a photographer these days is not an inexpensive hobby, avocation, or profession. We want to know that what we’re buying into is going to be around for awhile, that we’re making the right decisions about what to buy and from whom. We want to buy into products from a confident maker that understands their strengths and weaknesses, knows their customer needs, and is clearly solving user problems. Right now the results are mixed on those fronts. Some user problems are being addressed, others ignored. Some of the confidence is faux, some of it earned. Last Camera Syndrome — This group is rapidly aging, generally near or in retirement, and probably buying their last dedicated camera; will it be a Nikon? The point I’d like to make is this: had Nikon identified and addressed these same groups—even just with appropriate marketing—Nikon’s sales and unit volumes for the Imaging business wouldn’t be declining the way they are. Indeed, those last two groups represent potential gain, as opposed to just halting the decline. For those who aren’t into this type of analysis, I’ll just say this: check back next week. I’ll be tackling something different then, and maybe you’ll like that better ;~).